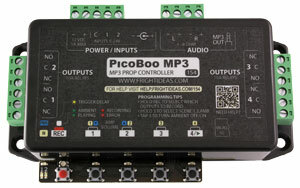 The PicoBoo JR replaced what was known as the PicoBoo 103. The trigger input was moved to a pluggable terminal block on the back. The PicoBoo replaced what was known as the PicoBoo 104. The trigger input was moved to the back and an internal amplifier was added. The PicoBoo AC replaced what was known as the PicoBoo 105. 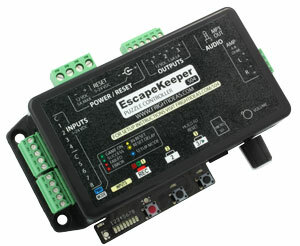 The trigger input was moved to the back and an internal amplifier was added. 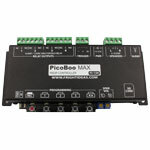 The PicoBoo MAX has been discontinued and replaced by the PicoBoo MP3. Version: 1.25 - What's Changed? The 'c' revision moved the audio jack to the back. Version: 1.62 - What's Changed? The 'b' revision moved the power jack to the back and removed the unused programmer port on the top. The PicoFX and PicoStorm are the same physical product. The only difference are the files we copy to the SD card before we ship. Version: 2.20 - What's Changed? This model has 4MB of internal memory so it does not require an SD card to operate. Our Director software will keep the firmware updated so there is no firmware download. Version: 2.88 - What's Changed? The 's' revision added a faster CPU, high current outputs, and moved the power jack, audio jack, and play button inside the enclosure. This model has 4MB of internal memory so it does not require an SD card to operate unless you need more space for audio. 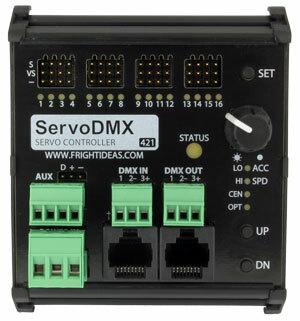 This download is for ScareMaster users only as our Director software automatically updates firmware and copies the necessary files. 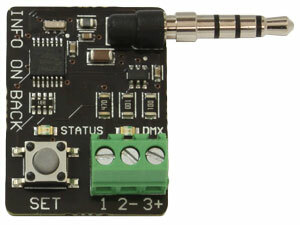 The 'b' revision can be identified if the letters DMX are next to the programmer port. It added a larger CPU and a DMX output option. The original Flex was originally available only with Molex outputs (shown). It was eventually offered with terminal block outputs. It does NOT have the letters DMX near the programmer port. This model has 4MB of internal memory so it does not require an SD card to operate. It does NOT support using an SD card for more audio storage like its successors. The 's' revision added a faster CPU, high current outputs, and moved the power jack, audio jacks, and play button inside the enclosure. This model has 16MB of internal memory so it does not require an SD card to operate. This product requires an SD card with these files on it to be inserted at all times. The BooBox 8 went through three different revisions that looked identical. 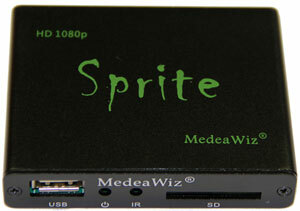 Version 1 had 32kB of memory and required an SD card for audio playback. Version 2 had no internal memory and required an SD card to operate. Version 3 included 4MB of memory and only required an SD card if more space was required. 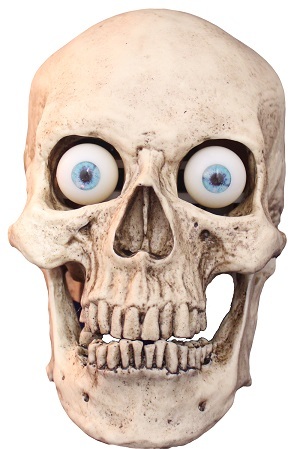 How much memory is on board can be determined by connecting to it with a ScareMaster or Director Connect. 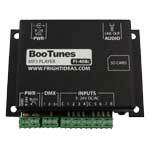 The BooBox 4 was originally designed to be programmed using the on board buttons or the ScareMaster. ScareMaster support has since been removed to allow newer products to be supported. The original BooBox that started it all. Even today many owners still believe this is the best BooBox we've ever made. High cost forced us to design simpler more affordable products we could sell in higher volume. This revision adds a second input and can handle much higher current than the previous revisions. 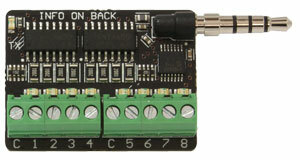 The 'b' revision added a trigger input and the ability to read a motor's park switch making simple position control possible. 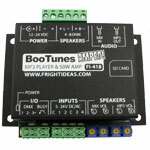 The 'c' revision added a small amplifier to boost the incoming line-level audio signal. This resulted in more realistic mouth movement and immunity to noisy switching power supplies. Since it looks identical to the 'b' revision you must read the revision number on the sticker to know which one you have. 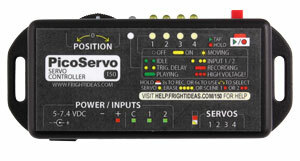 The 'b' revision added a head-turn servo output and LED eye outputs. It did away with the pass-thru audio jack and the ability to control two mouths with a single unit. 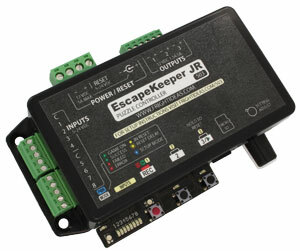 Please make sure you have the latest firmware before setting up your EscapeKeeper. Version: 2.26 - What's Changed? The ScareMaster Combo Update includes the necessary operating files for the ScareMaster, as well as the latest firmware for the products it supports. See the table below for the included firmware versions.